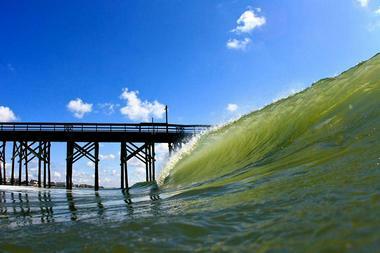 Pawley's Island is an Atlantic coast barrier island off the coast of the Grand Strand of Myrtle Beach. The small island is only 4 miles long and about a half-mile wide and is one of the oldest resort areas on the East Coast. Wealthy planters and their families originally frequented the island while on holiday. Today the island features many old beach houses and weathered summer homes among oleander and oak trees. There are few cars on the island so parking is limited. Travel by bicycle is easy and a nice way to enjoy a different way of life while on vacation. The Apache Pier is a family-friendly attraction located at the Apache Family Campground. The pier is the longest wooden pier on the East Coast. It is open every day of the year and provides a selection of fun activities for visitors and local residents. Visitors can walk the length of the pier to take a look at the ocean below. During the summer months, there is live music. Those who love fishing or wish to try fishing for the first time will find everything they need at Apache Pier. The pier offers rod and reels for rent as well as a full-service bait shop selling live bait, tackle, and more. Applewood House of Pancakes is a pancake house on Pawley Island’s Ocean Highway. The restaurant is best known for their fantastic weekend breakfast bar. The buffet-style bar includes a wide variety of pre-cooked items as well as cooked-to-order eggs and omelets, and it offers a good value for the price. Even though their weekend buffet has made them famous, the restaurant is a great place to grab breakfast during any day of your vacation. They serve a range of items including fresh fruit, cereal, traditional style breakfast, and of course pancakes. They have an impressive selection of omelets, including several with seafood like Awesome Amy’s Shrimp Omelet. Atalaya Castle is the former holiday home of Archer Huntington, who was the son of a well-to-do robber baron, and his wife Anna, who was a famous sculptor. At one time they owned a massive amount of property including what is now the Huntington State Park. The property includes more than thirty rooms built around a perimeter creating an enclosed courtyard in the middle. The large home has a 40-foot tall square water tower in the center that provided the home with water. The property also includes Anna’s sculpting studio and a small stable. During the summer tourist season, the castle is staffed with docent guides who provide one hour guided tours of the building and grounds. Black Rivers Outdoors Center is a canoe and kayak tour company and outfitters. The company offers two and four hour kayak tours guided by knowledgeable, local naturalists. 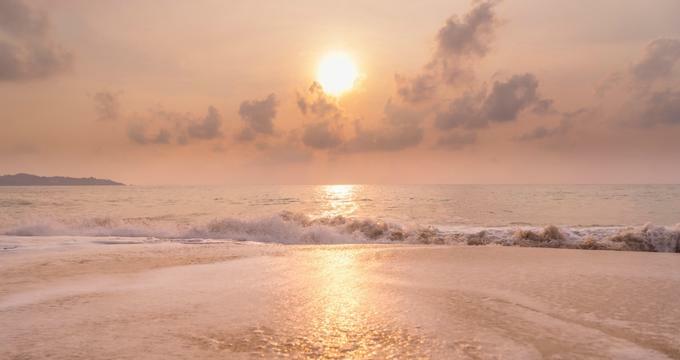 The tours explore the relaxed Tidelands of South Carolina, which include Huntington Beach State Park’s salty marshes as well as the Sandy Island Wildlife Preserve and the Waccamaw River Cypress-Tupelo Swamp Preserves. They also offer short tours of the Georgetown Harbor in the evenings as well as kayak tours by moonlight during the summer months. The tours use very stable solo and tandem river kayaks that are perfect for adventurers of any age. Blue Wave Adventures is a tour company that offers dolphin tours and kayaking adventures out of the Crazy Sisters Marina in Murrells Inlet. The dolphin tours are family friendly and are available to children age three and up and of course adults. The boat is a 42-foot aluminum vessel with seating for forty guests. They run their tours every day as long as the weather permits and offer six 1.5-hour tours each day. Knowledgeable tour guides narrate the tours, which include information about wildlife, history and interesting sites. Guests on the tours may have the chance to see dolphins, turtles, eagles, rays, sharks, jellyfish, and much more. Inshore Extreme Fishing Charter is a professional chartered fishing tour company that offers fishing trips guided by the well-loved Captain Rob Beglin. The trips can accommodate up to three anglers and any skill level. 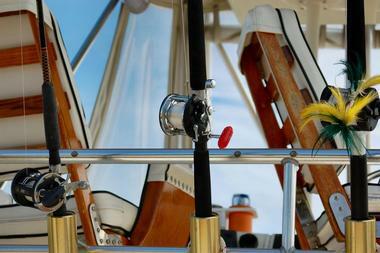 The company offers inshore fishing trips around Pawley’s Island and Myrtle Beach. Destinations include Bulls Ray and Cape Romain, South Carolina. Fish that frequent the areas include bull reds, sea trout, and other impressive catches. The knowledgeable captain has been taking people on fishing trips for many years and knows all of the best places to try your luck at reeling in a big catch. Caffe Piccolo is an Italian restaurant serving traditional Italian favorites with a locally inspired touch. The restaurant features an intimate space complete with a fireplace and a menu that reflects fresh, local seafood and produce. Caffe Piccolo is committed to using only the most fresh and local ingredients in their old family recipes. The restaurant offers gluten free pasta and bread options for those with gluten sensitivities. Vegan dishes are also available. The restaurant space can be reserved for private parties, and the staff of Caffe Piccolo even offers in-home catering where they go to a guest’s home and prepare meal for a party or special occasion. Captain Steve’s River Tours is a boat tour agency offering several tour options that explore the historic Waccamaw River by pontoon boat. They offer a different experience than simply laying on the beaches – they give tour-goers an authentic experience of a South Carolina River. The company offers four different tour packages. The Sandy Island tour is a 1.5-hour trip that visits a beautiful lagoon with sand dunes and manmade fingerlings. The Waccamaw River Plantation trip is a 2.5-hour trip that travels to a plantation from the 1800s. The Georgetown Tour cruises the Waccamaw River and Winyah Bay and stops at the Georgetown waterfront. Captain Steve’s also offers a customizable sunset cruise for groups up to six people. Carolina Guide Service offers chartered fishing trips for the whole family. A U.S. Coast Guard Captain who skillfully guides the boats through the backwaters and saltwater estuaries to find the best places to score a big catch leads the trips. The company operates trips year round and has an option of half and full day trips. Each fishing charter has room for one to four fishermen. The trip includes everything you need to enjoy a day out on the water, including bait, rods, tackle, and a fishing license. The trips are family-friendly, and children are welcome on any of their trips. The Cheryl Newby Gallery has been in business for more than thirty years on Pawley’s Island. The gallery once exclusively held antique maps and prints, but they have grown over the years to include a variety of art forms and media. They now also deal in fine paintings, ceramics, and sculptures. The gallery contains art from many local artists as well as nationally and regionally acclaimed painters and sculptors. The gallery hosts many shows throughout the year that reflect the variety of art forms held in the gallery. Of course, they still hold true to their original business model in some ways and offer one of the best collections of maps and charts in the region. High Country Olive Oils is a producer and vendor of ultra high quality extra virgin olive oils as well as aged Italian balsamic vinegar and other gourmet foods. They also sell a selection of body care products, gifts, and souvenirs. High Country has three tasting bars in the area, including locations in Augusta, Georgia and Aiken, South Carolina in addition to the Pawley’s Island location. Visitors to the tasting bars will have an opportunity to sample many of the oils and vinegars that High Country offers. The tasting bars are staffed with friendly, helpful, and knowledgeable staff members who can provide information about the products as well as answer any questions. 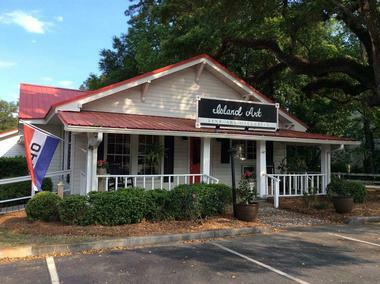 Island Art Gallery is an art gallery located in Pawley’s Island’s Village Shops. The gallery features a selection of fine art by local and nationally known artists. They offer services to both large-scale corporate and private art collectors as well as individuals, whether they are novice enthusiasts or established art collectors. Island Art Gallery also hosts educational art classes for the community throughout the year. Some of the classes that they offer include landscape painting courses, introductory art classes, and more. They also have open studio time where guests can reserve a spot and join any time there is room. The open studio time consists of independent painting in a group setting with an instructor available for help. Surf the Earth is a surf shop offering rentals, sales, lessons and tours on Pawley’s Island. They offer weeklong surf camps as well as lessons in either private or group format. Professional instructors who can effectively teach basic surfing skills as well as water safety teach the camps and lessons. For more experienced surfers, they offer board rentals and sales. Surf the Earth offers several eco-tour options that explore Pawley’s Island and the Litchfield salt marshes, including kayak and stand-up paddleboard tours. For an especially memorable experience, guests can book a full-moon kayak tour. Winyah Guide Service is a private fishing charter company that offers chartered fishing trips to several areas around Pawleys Island. Their chartered trips typically depart from Georgetown, South Carolina, but other pickup locations can be arranged. They offer both half and full day inshore fishing trips ranging from four to eight hours in duration. Fishermen on these trips can expect to catch redfish, flounder, sea trout, sharks, harpoon, and more. For those who enjoy hunting as well, they offer seasonal Cast & Blast trips that include fishing for redfish and hunting for marsh hens combined into a one day trip. Trips take part on a Maverick HPX-V 17, which is capable of handling choppy water but also accessing shallow areas.